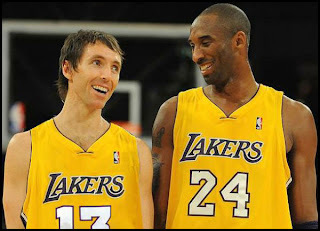 AverageBro: Steve Nash Goes To The Lakers. Steve Nash Goes To The Lakers. Uhh, seriously, wasn't the point of last summer's NBA lockout specifically to prevent "big market rich get richer" BS like this? If you're a fan of the Milwaukee Bucks, you might just need to face reality. Your team will never be an NBA champion. Not enough sun, too much bratwurst. Congrats to all the Lakers "fans". If Kobe adjusts his game accordingly, LA has enough firepower to get past Oklahoma City. As for Phoenix, well, at least you've still got nice weather. Question: Does Nash make the Lakers contenders? Where's Dwight Howard gonna end up!?!? But uh, seriously, why would you be a fan of the Milwaukee Bucks!?! ?